The One X has HTC's all-knowing phonebook with deep social networking integration. It manages to keep things neatly in order, even though it's juggling everything from SMS to Facebook photo albums. The second tab holds the texts, emails and call history between you and the given contact. The next one displays social networking contact updates, and the fourth one called "Gallery" pulls the albums that contacts have created on Flickr and Facebook. The transfer app is here to help you switch from your old phone. It supports many phones from major manufacturers and moves the data over Bluetooth. It's an old, but useful trick. The HTC One X had no problems with reception and the in-call quality was clear and loud enough. There is no 3G video call support out of the box though, you have to install a third party app. The dialer on the One X displays your recent calls and the list of favorite contacts underneath. Once you start typing on the keyboard, contacts will be filtered by name or by phone number. 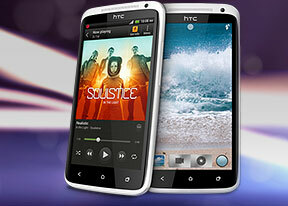 Here's how the HTC One X fares in our traditional loudspeaker performance test. It scored an Average mark placing just below the halfway point of our ranking and right alongside its One S sibling. Android and the HTC One X are capable of handling all sorts of messages - SMS, MMS, email. Social networking is covered by several apps and widgets, and there's Gtalk, which can connect you to Google's chat network and compatible networks too (like Ovi Chat). Text input on the One X boils down to an on-screen custom-made HTC virtual QWERTY keyboard. While it's still not as good as a hardware one, it's the next best thing - the 4.7" screen has enough real estate for big, well-spaced keys, which are easy to hit. The HTC One X comes with two email apps - the traditional Gmail app and the generic HTC Mail app, which merges all your email accounts into a single inbox. You can add multiple accounts (from multiple services) and view them individually or in a combined inbox. Each account is color coded, so you can quickly associate each message with its relevant account. There's hardly anything we can think of that the HTC One X lacks in terms of email capabilities. The settings for popular email services are automatically configured. POP/IMAP accounts and Active Sync accounts are supported.